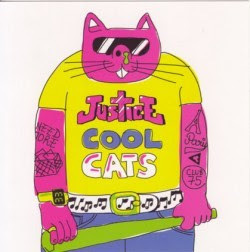 Here's a track listing the lovely Justice did for the awesome Cool Cats Crew. WOW. What a great track listing gee whiz. A combination of Ed Banger hits, combined with classic anthems, and truly great electro compositions. We report the Ed Banger news, we don't write it. We apologize for the claimed error and look forward to producing better articles in the future. Thanks! hate to break it to you guys but this is in fact a fake mix. Jus†ice did NOT make it. They even posted about it on their myspace. even correct one of the tracks: Oh Sheila is by Ready for the World not Prince and Sheila E.
Listen to the justice live a trash 2006/07. its on the trash podcast. very very similar tracklist. nice set. was this supposed to be a new released mix? or just a leaked tracklist? love the blog. keep it up lads!